Here is a list of best free PowerPoint to HTML converter software for Windows. Using these free software, you can convert existing Microsoft PowerPoint presentations (PPT, PPTX, etc.) to HTML documents. Besides that, you can also convert PowerPoint presentations to formats like PDF, JPG, SVG, EMF, EPS, SWF, etc. While most of these are presentation creator software, one of these software is basically a printing application. You can use presentation software to create new presentations or edit existing ones. The printing application that is listed in this article can be used from another presentation software which has a print option. For example, you can provide print command using this printing application from WPS Presentation which is a nice presentation maker software. Prior to the conversion of PowerPoint presentations to HTML, you can customize a lot of parameters in most of these software. These output parameters include publication type, image format, monitor resolution, title page information, color schemes, etc. 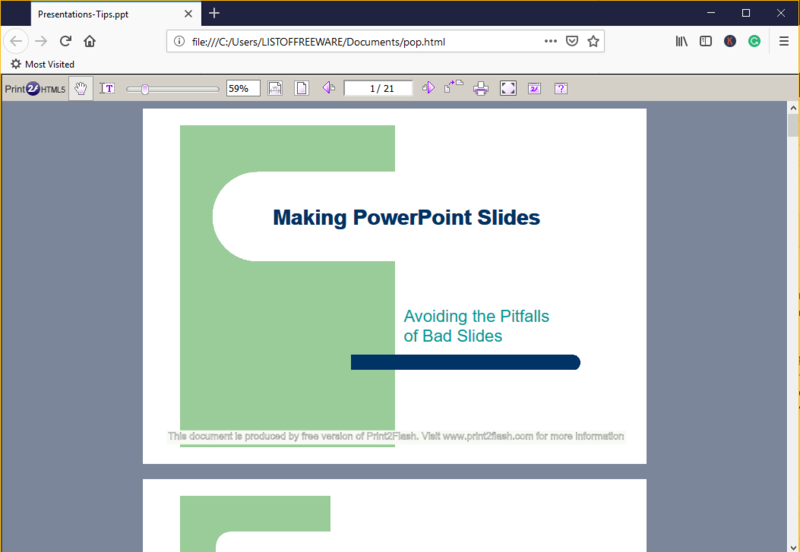 Also, you can edit the PowerPoint presentation before converting it to HTML, such as insert new content, edit or format existing content, customize transition effects, add new slides, change slide layout, etc. All in all, these are capable PowerPoint to HTML converters which are also easy to use. LibreOffice Impress is one of my favorite software to convert PPT or PPTX file to HTML. It is a complete presentation maker and editor software for Windows as well as Mac and Linux. It can be used to import existing presentations, edit them, and then convert them to other formats including HTML. Also, this software is a part of the popular LibreOffice suite containing some more office software which you can use. You may also like some best free PPT to PPTX Converter Software, PowerPoint to Video Converter Software, and PowerPoint to Flash Converter Software for Windows. LibreOffice Impress is a free open source presentation creator and editor software for Windows, Mac, and Linux. Using this software, you cannot only create PowerPoint presentations, but you can also convert PowerPoint to HTML. Let’s see how. Import a PowerPoint presentation file using File > Open option. If you wish to edit your presentation prior to conversion to HTML, you can do that too. Now, go to the File > Export option and select the output format as HTML. You will now be navigated to a dialog box where you are allowed to design output report by configuring specific parameters. These parameters include publication type (Standard HTML Format, Standard HTML with frames, Single Document HTML, Automatic, or WebCast), create title page, show notes, image format, monitor resolution, metadata of title page, color schemes, etc. After configuring above mentioned parameters, click on the Create option to finally convert PowerPoint to HTML. You can find presentation creation tools like insert objects, apply transition effects, select slide layout, format added content, etc. It provides encryption and digital signature features to add security to created presentations. Spellcheck, Autocorrect, Macros, Color Replacer, and more features are present in it to help you create presentations. You can export presentations to a lot of formats including Apple Keynote, Legacy StarOffice Presentations, SVG, EMF, EPS, SWF, PDF, HTML, BMP, etc. LibreOffice Impress comes with a famous free alternative to Microsoft Office called LibreOffice. It is one of the best office suites which also acts as a PowerPoint to HTML converter. IBM Lotus Symphony is another free PowerPoint to HTML converter software for Windows. It is an office software which lets you create professional presentations. Apart from creating presentations, you can convert them to some other formats including HTML. It lets you convert presentations in PPT, PPTX, POT, POTX, and more formats to HTML reports. Firstly, import a PowerPoint presentation to this software. You can now review the presentation slides as well as modify them using available tools. Now, click on the File > Export option, set output file type to HTML, configure output HTML report settings, and save PowerPoint presentation as HTML report. Before publishing a presentation to HTML, you can select publication type as Standard HTML Format, Standard HTML with frames, Automatic, or WebCast. Furthermore, you can setup options like create a title page, show notes, graphics format (JPG, PNG, or GIF), monitor resolution, export sounds when slide advances, color schemes, etc. You can also add metadata to title page. You can add a variety of content to your presentations before exporting to HTML, including table, graphics, video, sound, charts, cliparts, shapes, flowchart, callouts, symbols, hyperlinks, header & footer, etc. It lets you apply animation effects between slides and added content. You can find some additional handy tools in it, like Eye Dropper, Instant Corrections, SpellCheck, etc. You can export presentation in formats like PDF, JPG, ODP, etc. It allows you to encrypt created presentation as well as add digital signature to them. It is another nice free software which can create PowerPoint presentations as well as export them to HTML, PDF, and other formats. Print2Flash is a printing application which basically converts printable documents to HTML. Using it, you can also convert PowerPoint to HTML5 format. Besides HTML, it can convert documents to Adobe flash file i.e., SWF file. The process to convert PPT or PPTX to HTML using it is slightly different. Checkout the below steps in order to convert presentation slides to HTML with this printing software. In order to use this software to convert PowerPoint to HTML, you first need to open the PPT or PPTX file in a presentation software that has a Print option. You can use WPS Presentation or some other software from this list > PDF Presentation Software. Do make sure that the software must support PowerPoint files as input. After opening the PowerPoint presentation in a software, you can go to the File > Print option in order to give printing command. While doing so, set the printer to ‘Print2Flash 5 Free Printer‘. And, you can customize some more output settings including print range, print elements (slides, handouts, outline, etc. ), number of copies, etc. After doing so, click on Ok button and this printing software will open up the presentation slides on its interface, in HTML and Flash output tabs. You can now use the Save HTML option to create an HTML document from the PowerPoint presentation. Before that, you can customize output width and height. You can checkout the full screenshot to view the output HTML document created with this software. It adds a watermark to the bottom of each slide in the output. You can purchase its commercial edition to unlock more features and to use it for commercial use. This is a nice and easy to use printing software which you can use with a presentation software to print PowerPoint presentations to HTML5 or Flash format.